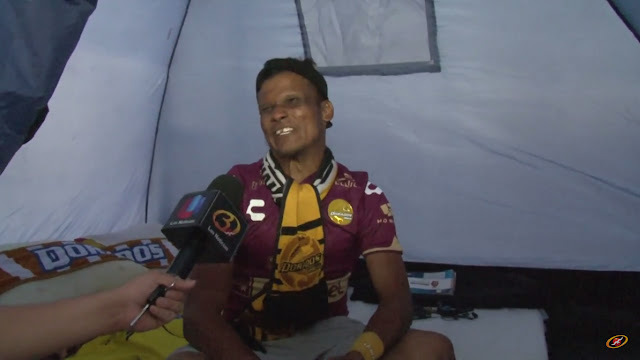 Walking out of the stadium 17 minutes before the completion of a match to protest ticket prices is one thing, but a fan of Mexican top tier club Dorados de Sinaloa has made Liverpool fans' recent protest look miniscule as he spent 12 days in a tent in front of his beloved club's stadium to protest recent poor results. Sinaloa is not known as a powerhouse in Mexican football to begin with, but after finishing dead last in the league's opening championship (Apertura), the club began their Clausura campaign with five straight losses in their first five matches. Sitting with no points at the bottom of the table and facing relegation to Ascenso MX (the countries 2nd tier), a fan that calls himself the "Golden Boy" has decided to take matters into his own hands. He himself does not seem to be sure as to how spending his days in front of the stadium in a tent will solve the club's performance issues, nonetheless, the die-hard supporter hopes that club officials will see his dedication and decide to change things around in a last ditch effort to keep the team in the first tier (which is at this point almost impossible by the way). For your viewing pleasure I include an interview with "Golden Boy". Although the interview is in Spanish, the visual alone is pretty self explanatory.